We start by making Crutons. Crush the garlic cloves with the side of a chef’s knife or a garlic press. Slice the baguette into 1/2 inch cubes. Combine garlic, oil, salt, and bread cubes in a bowl. Mix until cubes are coated evenly. Spread the coated cubes onto a baking sheet and bake until the croutons are golden (about 10 minutes) . You can store the croutons in an airtight container in the refrigerator for up to one day if necessary. Crush the garlic clove with the side of a chef’s knife or a garlic press. Bring a pot of water to boil, add egg and cook for exactly 45 seconds. Remove from heat and let it cool off. Mix worcestershire sauce, lemon juice, garlic, salt & pepper, anchovy, and mustard in a bowl. Crack egg and add to these ingredients. Whisk until smooth. Slowly add the oil in a steady stream while constantly whisking again until smooth. If you add the oil too quickly, the dressing will be separate. 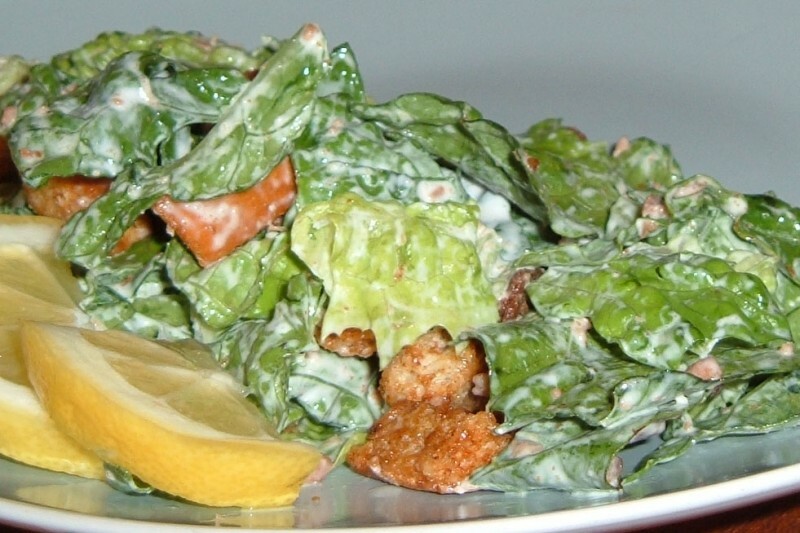 Tear the romaine lettuce into 1-2 inch pieces and add them to a large bowl (wooden if you have one). Add half the dressing and toss. Add the remaining dressing, Parmesan cheese, and croutons and toss again. Serve on chilled plates. Bon appetit! 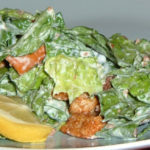 I had always wanted to try making caesar salad from scratch. It was quite a bit more work than I had anticipated, but it ended up with good results. This recipe has been shortened quite a bit - The Reluctant Gourmet really likes his cooking notes!